Glemseck 101 is just around the corner. 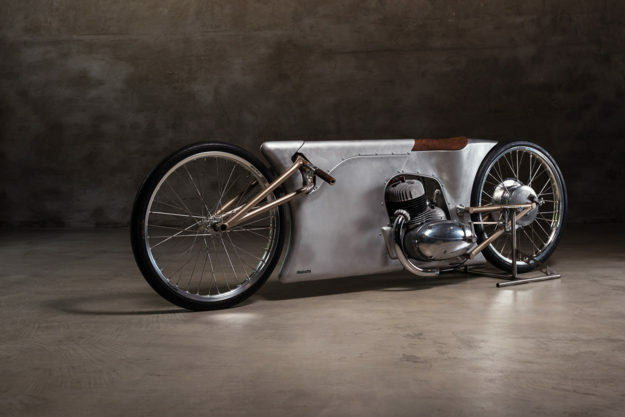 Set in southern German town of Leonberg, it’s a two-wheeled celebration of gasoline and good taste. It also attracts some of the most outrageous customs on the planet. We’ve seen everything from turbocharged boxers to fire-breathing Yamaha XJRs. 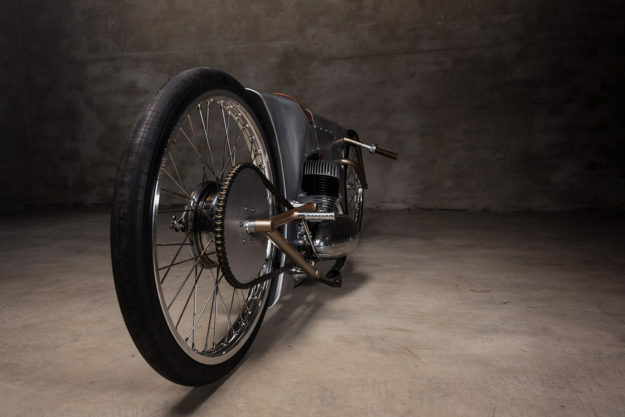 But a 350cc Jawa with a steampunk vibe? Now das ist different. 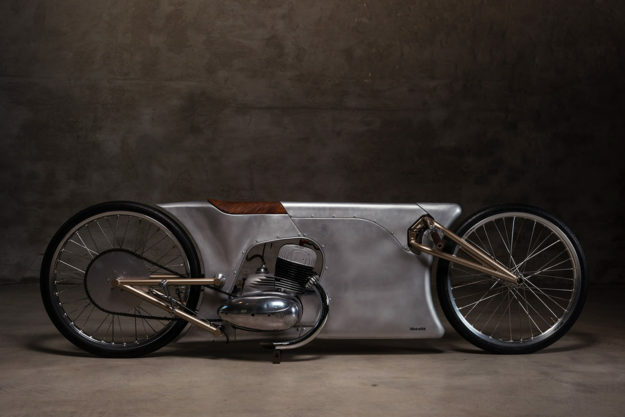 This is what Berlin-based Urban Motor have built for their entry into Glemseck’s inaugural Essenza sprint. 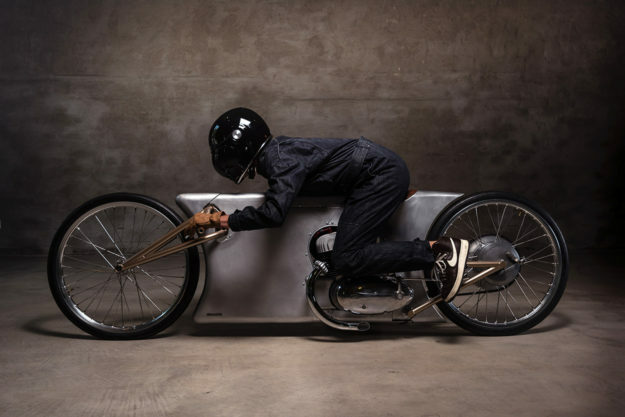 Sixteen teams will compete—a mixed bag of manufacturers and custom builders. The bikes are limited to two cylinders and a 1200cc maximum. But it’s as much about style as it is about speed. 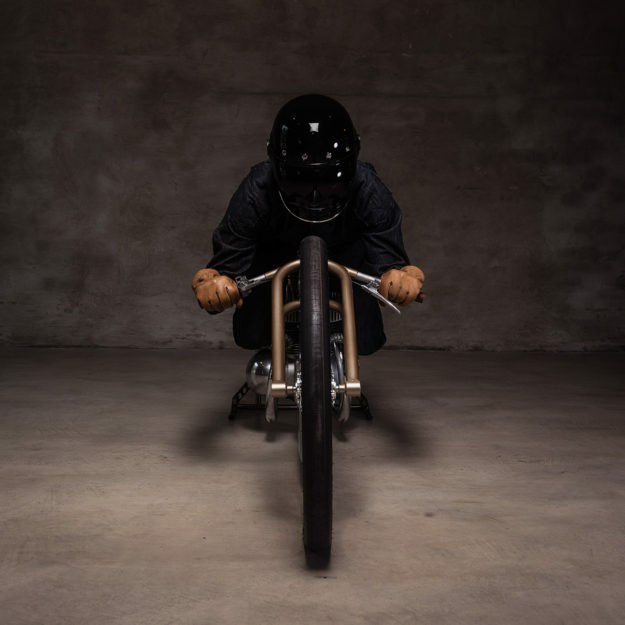 A panel of judges—and a public vote—will determine the best-designed bike, to be crowned alongside the fastest. No prizes for guessing which category Urban Motor are gunning for. 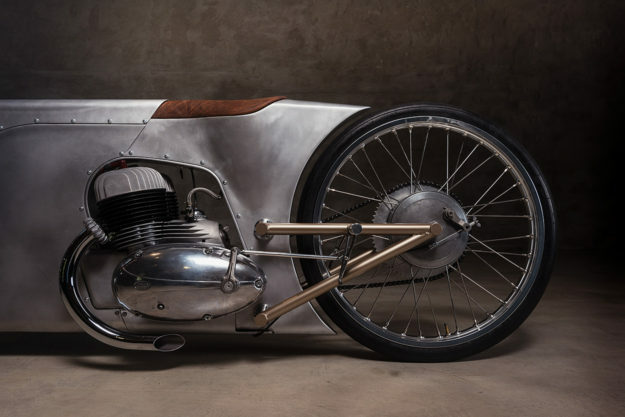 With a whopping 18 horsepower on tap, this little 1964 Jawa 350 will be racing against 21st century machinery like the BMW R nineT and Triumph Thruxton R.
We love the elegant minimalism at play here, which shows the incredible amount of work from designer Henry Schulze. 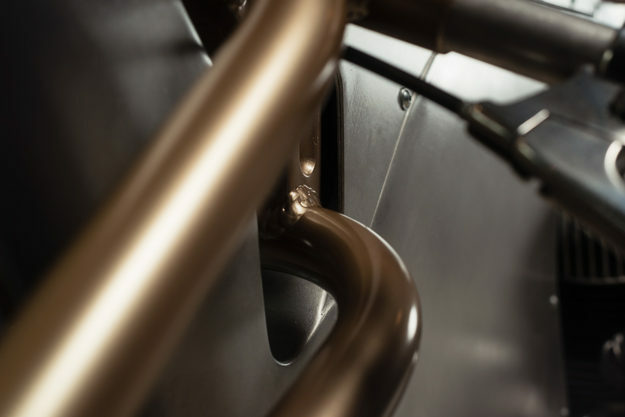 Everything is wrapped around the Jawa’s two-stroke mill, and it’s completely custom-made. 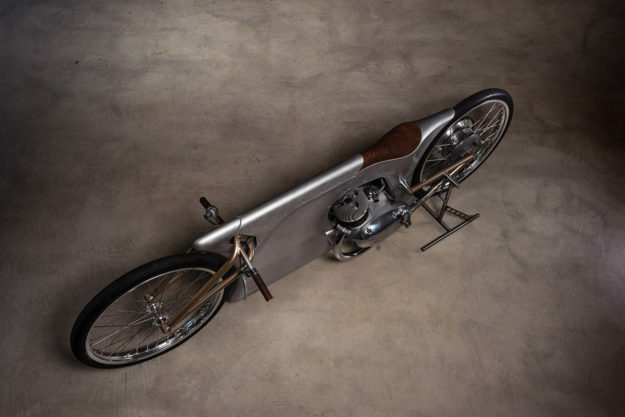 Urban Motor tossed all but the engine, before building a whole new chassis from steel tubing. The design of the alloy bodywork was a collaboration with Marvin Diehl of KRT Framework, who fashioned the metal himself. Marvin was also responsible for the Jawa’s quirky front suspension design, with its integrated handlebars. And no, we don’t know how it works. Everything’s book-ended by two skinny, 23” alloy SM Pro rims. A solitary drum brake (at the back) handles the stopping duties. On the engine side, Urban Motor have installed a Jikov carb, and fabricated a pair of short, graceful exhausts. With no need for lights or turn signals, the wiring’s been stripped down to the bare essentials. 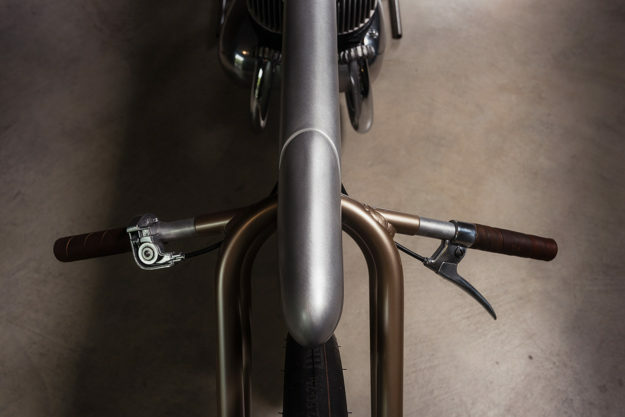 The Jawa now weighs a svelte 90kg, with finishes as tasteful as its silhouette. Sven van den Brandt handled the only paint on the project: a touch of matte gold on the forks and swingarm. 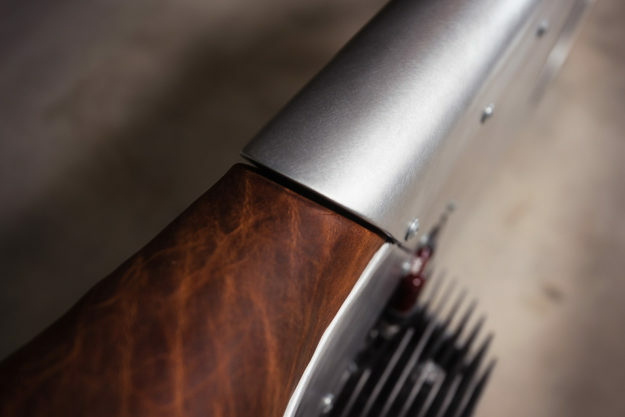 The grips are wrapped in leather from Red Wing, and the seat was made to spec by C. Benda. There are some smaller details to digest too: from the exposed throttle assembly, to the direct-mount rear sets. Will it win the races? Probably not, but you can bet it’ll win hearts.